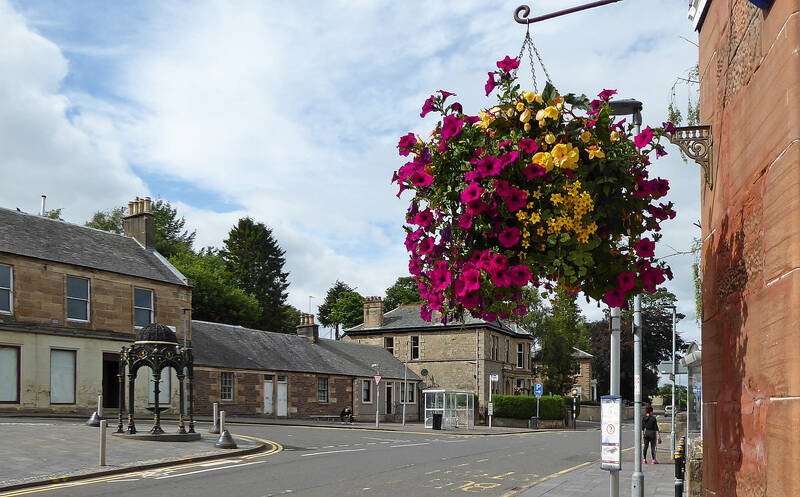 Abbeygreen is probably the most important road in lesmahagow and is its "main street" containing shops, banks, churches and a public hall. At the south, it begins at Turholm Bridge until its junction in the North at School Road. The road there contines straight on as "Milton". This series of photos starts at the south end at Turfholm Bridge and continues North. Two views of the Turfholm Bridge end of Abbeygreen Road. Date: 7th February 2014. The second includes the local bus (Colin's bus) run by the Rural Development Trust. Hope Hall taken from Old Brae on the 8th May 2014. This old building was the headquarters and Lesmahagow Branch of the Coalburn District Co-operative Society in the early part of the 20th Century. Church Square with Lesmahagow Old Church. Craignethan Apartments (former hotel) are on the left and the Nisa store and Post Office on the right. . Date of photo: 11th June 2018, shortly before the Highland Games, hence the bunting. Pepes Fish and Pizza Bar, Lesmahagow at the junction of Abbeygreen and New Trows Road. 24th July 2018. Floral display near the Fountain. 24th July 2018. The Fountain, Lesmahagow. 15th April, 2012. The junction of New Trows Road with Abbeygreen with the cast-iron Fountain. The building opposite is also called The Fountain, orginally thr Parish Church Hall bur rebuilt togaether with a new branch for the Bank of Scotland (pn the left). The building was first used as a restaurant but, after the restaurant closed, it was bought by the Council to convert into a public hall to replace the Jubilee Hall.